Looking out, looking back, and looking forward. The 48 taught me what mattered in life. The 67 refined it. Now, I’m looking toward doing the Appalachian Trail, and seeing what that brings. Starting out on the New Hampshire 4,000 footer list, I never even knew to imagine I’d be who I am now. Back then, a mere eight or nine months ago, I was just going to hike a list I’d known about for years, and perhaps broaden my horizons. I’d be pushing myself to drive a little further than my local mountain and see if things truly were a little different. More than that? It never occurred to me. Early on, I’d read up on the various mountains and trails, and then go apply that knowledge. Over time, and with experience, it became less important to know every nuance. I was comfortable just knowing how to find the trailhead, and maybe a little about the basic route. For the most part, route finding took care of itself. 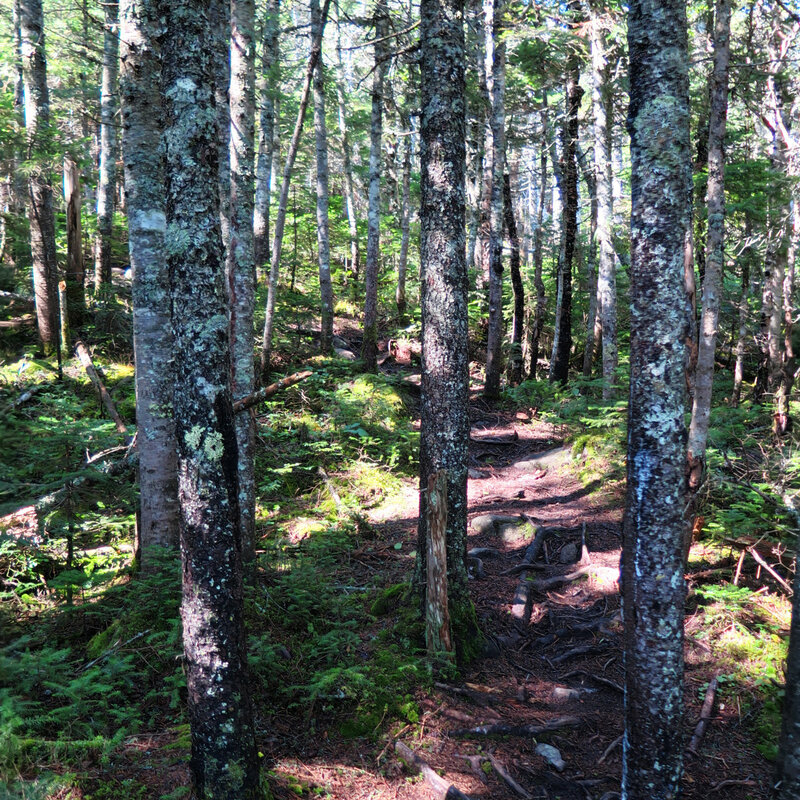 A lot of my hikes followed the Appalachian Trail and its many familiar white blazes. For everything else? Well, I learned what an AMC trail should look like, and went with that. Researching the mountains, and their flora and fauna, I came to find out about the 67 and the Hundred Highest lists. Where the trail sported some well-known white blazes, I came to become adept at spotting the AT hikers, and learned more about that unique experience. Yep, I broadened my horizons, that’s for sure. I never thought I’d ache to set off from Springer Mountain in Georgia on a long walk to Katahdin, but thanks to those hikers, now I do. In doing the 48, I tried to organize my hikes according to mountain ranges. The Whites are a concentrated glom of mountains, without linearity or other easy categorization, so that’s what I had to go by. I was mostly successful, and it added hugely to my understanding of the land and its biomes. Turning to the 67, I saw the mountains could be organized linearly with ease. 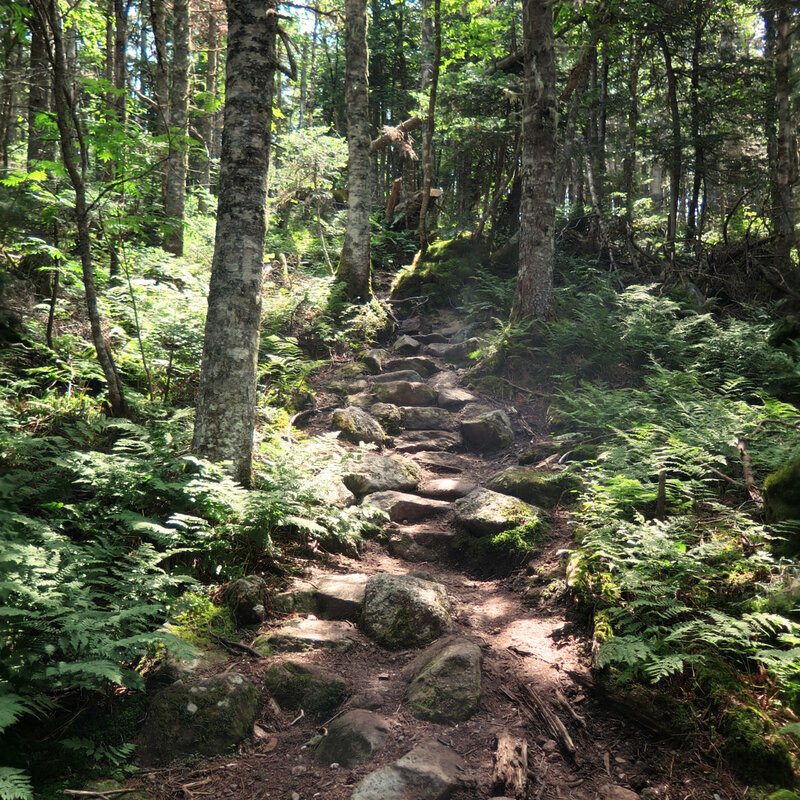 I could start in Vermont and go down the Long Trail to where it met the Appalachian Trail, and then jump over to Old Speck in Maine, and go in order along the AT toward Katahdin. On my first hike of that fateful 48 list, I met some wonderful people on the trail, and that continued as a theme throughout. The weather changed often, some trails were rocky while some were smooth, but the constant was all the wonderful people I met. Those AT hikers really made me want to join them, and even though I kept to day hiking the 67 as I did in the Whites, it gave me a taste of that venerable trail. Before long, I found myself planning things so I could hike on the AT whenever possible. On the trail, as the opportunity arose, I listened intently to their stories. And slowly but inexorably, that trail became a beloved friend. 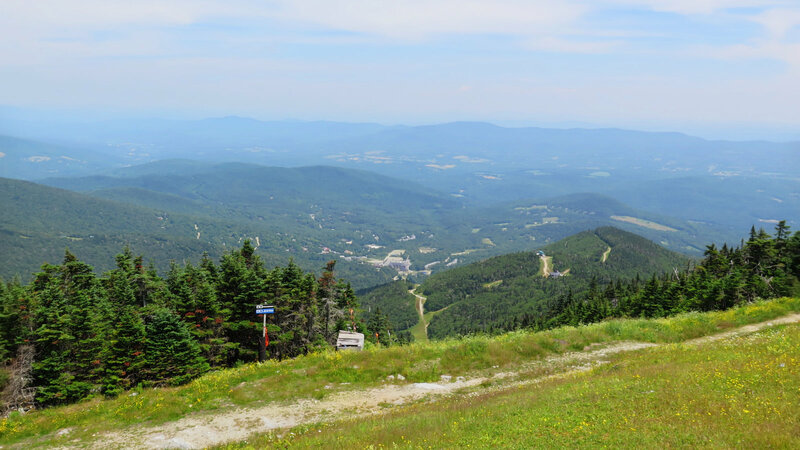 My first mountain of the 67 was Mt Mansfield — Vermont’s highest peak, and notably, nowhere near the AT. My last was Katahdin’s Baxter Peak — Maine’s highest, and the terminus of the AT. That’s a nice pair of bookends that stand in stark contrast to each other. Vermont was bucolic farmland, Maine was serene isolation. The trail isn’t the same everywhere. Vermont kicked off with a beautiful day and endless views near the first of summer. I remember a quick hike over fairly easy terrain, with fantastic views. The sun was bright, the trail verdant. Oddly, I really remember the cell phone towers, the farms and pastures, and the ski lifts everywhere. (If I learned anything, it’s that Vermonters love to ski.) I remember a lovely chat with a Long Trail thru hiker as we enjoyed our lunch with a magnificent view. As always, the trail’s gifts are in the hikers and their stories. Along the way were some surprises. Reddington, with its sense of being a well kept secret, hidden away on an unmarked trail. On Camel’s Hump, a downed airplane. 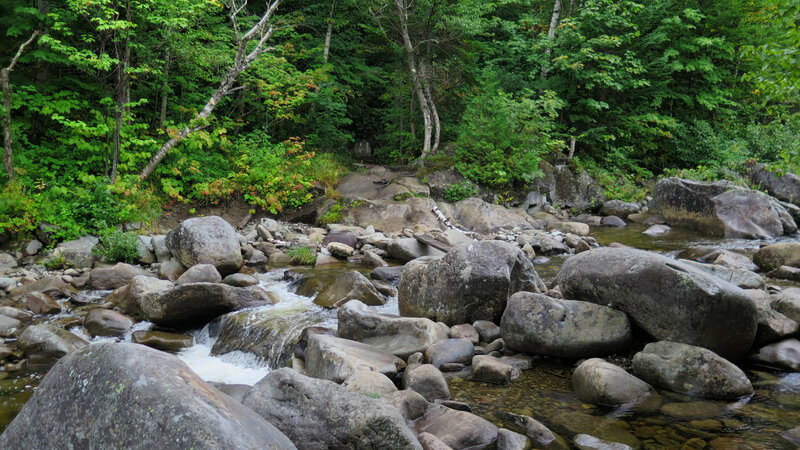 In the Carrabassett Valley, serenity. More and more, I saw those white blazes heading off to distant points, and I felt their tug. I learned about Benton MacKaye and Myron Avery. In no small part, they humanized the trail for me as much as Kate Sleeper and Arnold Guyot humanized the Whites. I chatted with locals. I learned about their communities. My horizons broadened. Katahdin stood in stark contrast to Mansfield. I was a couple weeks into autumn, and rain was in the forecast. It was the hardest, most technical hike I’ve ever done, with some of the worst views, due to heavy cloud cover at the summit. If that wasn’t enough, the wind was howling at more than 50 miles per hour. And yet, that hike was one of the most rewarding — on par with how I felt after finishing Owl’s Head. And on the way down, I met some AT hikers, and learned their stories. That one mountain bestowed so many gifts, but it was merely emblematic of the trail’s bounty. The other day, I returned to my beloved White Mountains, and specifically to Franconia Ridge, which is a spiritual home for me. I hiked Mt Liberty and Mt Flume, and gazed out over the Pemmigewassett Wilderness. I spied Owl’s Head, The Bonds, and South Twin. Garfield, Galehead, Whiteface. I looked down upon the maples, turning yellow and red, and thought about the coming winter. Whereas before I couldn’t have a single defined thought about all of those peaks, now, I have a bevy of memories from each of them. On the way down, I touched a lot of AT blazes, and thanked that trail for giving so much to me. Returning to the trailhead, I looked back, then looked forward, and laughed out of sheer bliss. Your account of Katahdin is strikingly similar to my own (same month & weather), and was also my last of my 67. I’d like to share the last paragraph of my essay if that’s alright. I could just begin to make out the silhouette as the sky shifted from black. With my pack on, I slipped my hands into my pole loops and took the first step. The forest slowly came into view shortly thereafter, and the sound of the falls greeted me as the trail bent left and upward. I had two peaks to visit today, and I would circumvent the last to visit the first, following the bypass around the cone. As I approached the alpine zone and the trees began to thin, I thought that I might have missed the bypass and was destined to reach the last peak first, however, after checking the map I figured that I still had some distance to travel before the intersection. I had heard about the flat before the summit, and was quite ready to enjoy that break from the scramble as I crested what turned out to be only the end of the first rise. Taking a deep breath, I smiled to myself, knowing that this wasn’t the first time (nor the last) that I had misjudged a mountain. Did I really think it would be that easy? What I did see was an impressive stretch of increasingly vertical rock unlike any I had encountered before. Moving up the stone spine, I noticed that an undercast was coming in from the southwest and although it was early, I still had miles to go and knew that a front was supposed to move in sometime after 1 pm. Not savoring the idea of heading down in damp conditions, I stashed my poles opting for hand holds and hurried up the incline, the last section being the most challenging, both technically and physically. As the landscape flattened out, it took on the appearance of a highland meadow (albeit a stoney one). A short while later I arrived at the intersection bearing a plaque for the naturalist for whom the spring that was flooding the trail was named after. In the distance I could see the last rise leading to the final summit, but I headed left to follow the bypass to the first peak. As I snaked around the summit cone and dropped into the col between the two peaks, the wind rose up from the bowl below with considerable ferocity. It was at this point as I was passing through the low point between the two peaks that I noticed that my breathing became labored, not that I was working any harder, but it seemed as though I was having trouble acquiring enough oxygen from the air, and it seemed to coincide with the onset of the wind. It was cool, but not cold and I wasn’t wet, yet I knew that it was well within hypothermia range. I had never experienced this sensation before, but it was worth making a mental note and I continually performed small tests on myself, checking the time, simple math problems, singing songs and noting my recollection of the lyrics to make sure I wasn’t losing it. Arriving at the first peak, the wind was at its strongest as I briefly took in the moonscape around me, a bald speckled with rocks of varying size, and hurried back down from where I came. It was only after I had passed through the saddle and began the final climb that the wind ceased somewhat and although I was heading uphill, my breath had returned to me. I noticed two hikers a short distance ahead of me, and I was glad to know that I wouldn’t be alone. The talus-strewn terrain slowly leveled off, revealing a large, weather-beaten sign. As I approached the young couple who arrived shortly before me, I felt a sense of joy and accomplishment, but also relief. Up to this point, my approach to hiking was one of focus and efficiency, stringing together peaks and using the most direct routes, moving quickly and not always pausing long enough to appreciate all the natural beauty around me. Now that I had accomplished this goal, I made a deal with myself that I would make an effort to stop and smell the spruce a bit more often on the less direct route.